When you think of castles you probably think of the ornate former homes of royal dynasties and emperors. Grand steeples and tall towers might come to mind. But an icy attraction in the United States and Canada will make you rethink your definition of the word castle. 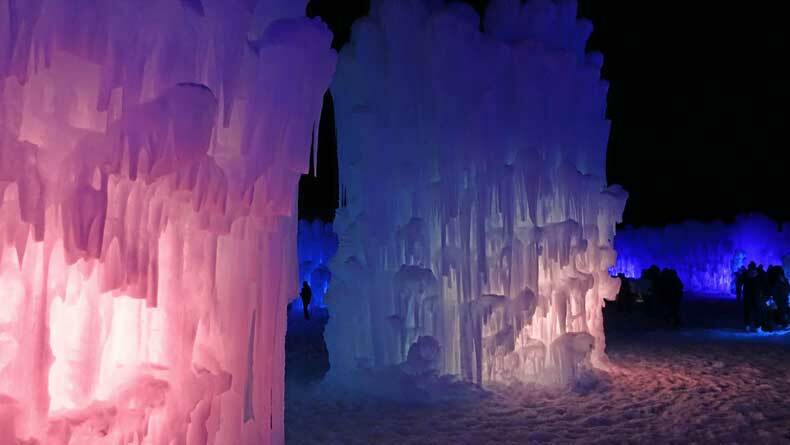 Ice Castles is a winter destination that has taken North America by snow storm. I first stumbled across Ice Castles in January 2012. It was the day after my husband and I got engaged. We were on our way from Denver to Steamboat, Colorado for a ski trip. Just off the highway in a small town in Summit County, Colorado we saw these fantastic frozen structures. They were like nothing we’d ever seen before. We were both instantly wowed. “Woah! What is that? !” I exclaimed, as we slowed down to get a better look. Although we desperately wanted to stop and check it out, we had to keep driving if we were going to make it to Steamboat before the roads got too icy and the highway shut down. I wouldn’t tour one of the Ice Castles for another 5 years. 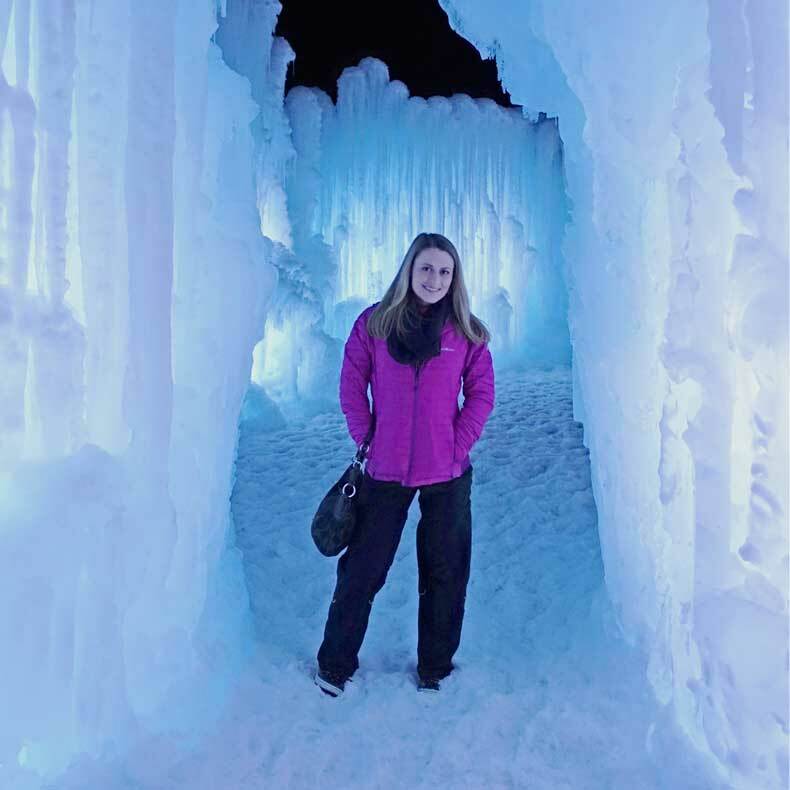 In December 2016, on a trip to Utah, I finally visited the Midway Ice Castles, one of six Ice Castles locations across North America. 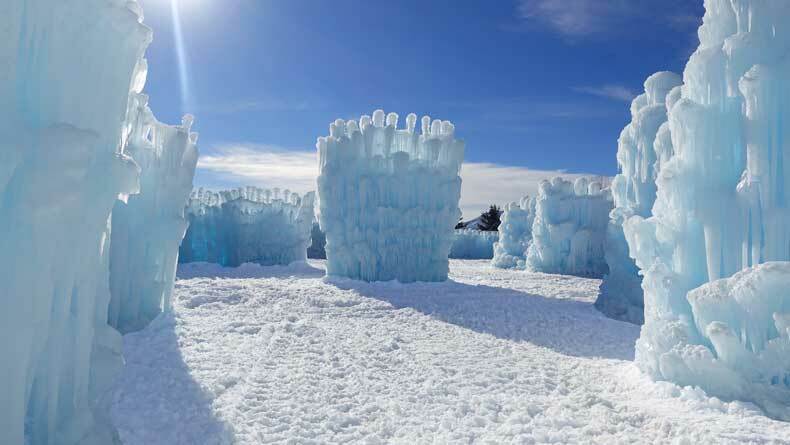 The Midway Ice Castles are located about 30 minutes outside of Park City in Heber Valley, a charming yet adventurous area of Utah. Walking up to the breathtaking creation, I got the same sense of wonder that I did so many years before when I first laid eyes on one of the frozen attractions. Stepping inside the frozen palace was like entering a mythical world found only in childhood fantasy books and fairy tales. Intimidating icicles dangled overhead while serene lights illuminated the ice and gently twinkled and danced along to music. Despite being surrounded by crowds of other awe-struck visitors, it seemed perfectly peaceful and strangely quiet inside this icy paradise. It was a Friday evening and fire performers were spinning, juggling, and breathing fire. They captivated the audience with each talented twirl. I watched for a few moments before wandering away alone to check out more of this frozen fantasy world while the crowds were distracted. In one area of the Midway Ice Castles, kids giggled in glee as they slid down ice-carved slides and crawled through tiny tunnels. Their parents stood nearby watching with proud smiles. Couples snuggled together as they watched the lights inside the ice cast a romantic glow throughout the attraction. A large fountain in the center of the icy courtyard added another visual element and made a relaxing, zen-like bubbling sound. I made my way through a series of maze-like tunnels, taking pictures with ever lighting change. The icy formations had an organic beauty that looked like they somehow naturally formed right there in the field. The towers of ice weren’t carved or sculpted, like those at the famous Harbin Ice Festival in China. Instead, they cascaded down like frozen waterfalls. It was an incredible experience! Enchanting even. Unfortunately, like all good things, the Midway Ice Castles don’t last forever. If you want to visit them, it’s best to plan your trip in January or early February. I’ve seen the Midway Ice Castles both during the day and at night. While they are beautiful at all hours, I personally loved seeing them illuminated in the evening. Weekdays are a bit less crowded, but on weekends, you can often catch special events at Ice Castles like the fire performances, or you can get your child’s photo taken with the princesses from the movie Frozen. 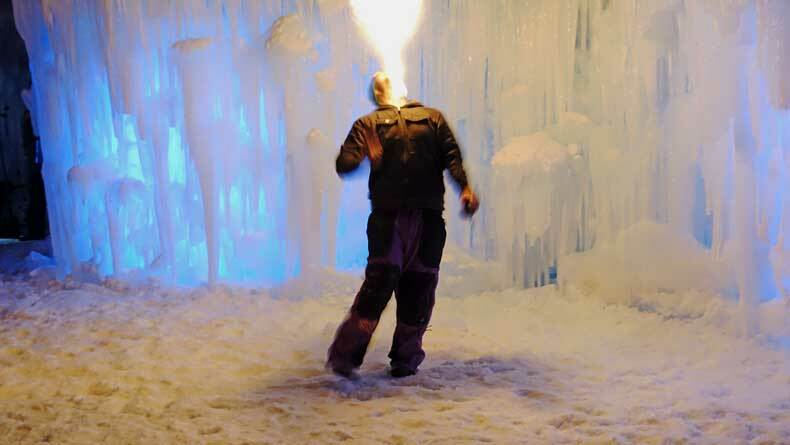 I first visited the Midway Ice Castles, just outside of Park City, Utah, but the company who creates Ice Castles has locations in several cities across the United States and Canada. 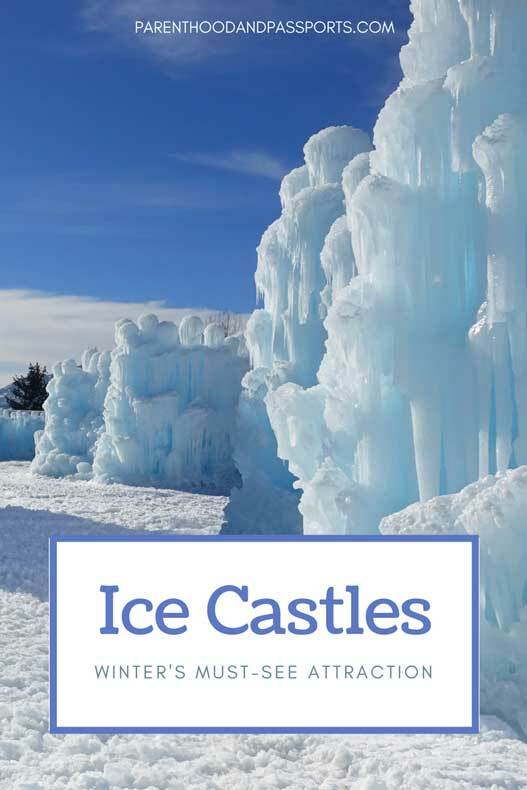 According to their website, in winter 2018/2019, you can find Ice Castles in five states in the USA – Colorado, New Hampshire, Minnesota, Wisconsin, and Utah. They also have locations in the Canadian province of Alberta. 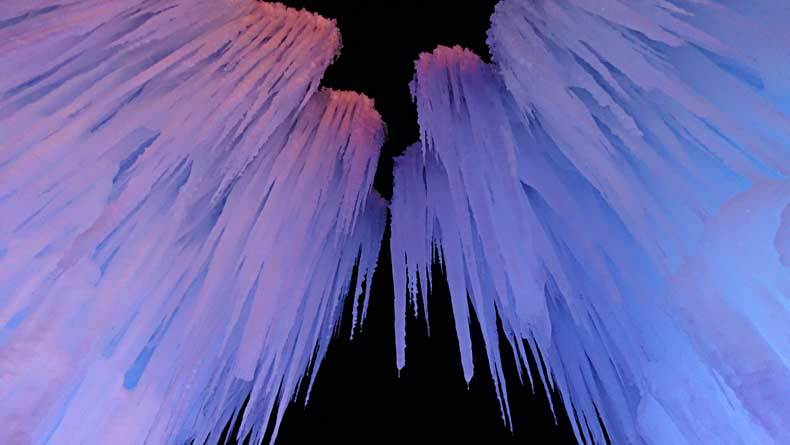 I’ve since visited Ice Castles in Colorado and New Hampshire, and like the Midway Ice Castles, they were equally breathtaking. 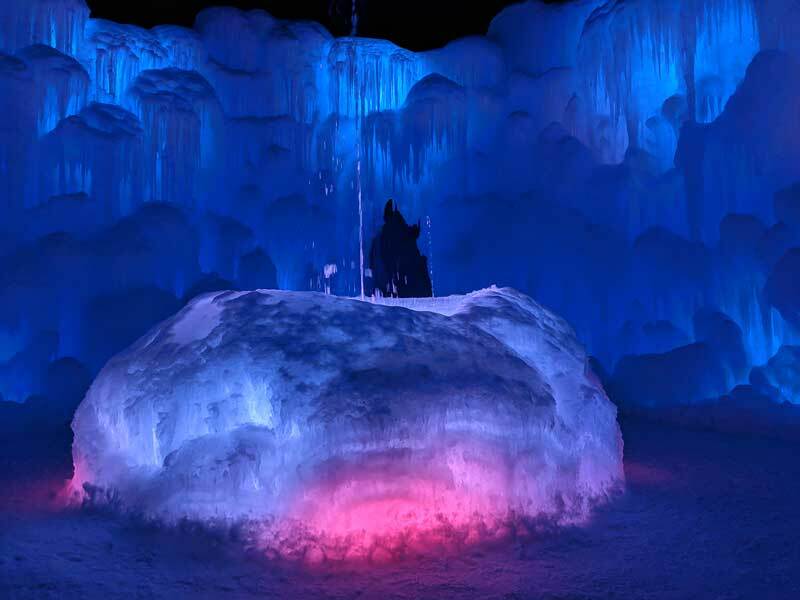 If you plan to visit Ice Castles, give yourself about an hour to an hour and a half to tour the attraction. It’s over an acre in size, so you’ll need at least an hour to truly take it all in, explore the attraction, and whiz down the slides a couple of times. Before you visit, here are a few things to keep in mind. Dress warmly. It might go without saying, but you’re in a giant castle of ice. It can get fairly cold, so layer up, wear a good pair of snow boots, gloves, and a hat. If traveling with small children, it’s easiest to wear your baby in a child carrier or pull young children in a sled. Strollers don’t work that great on snow. Bring a good camera. Although smartphone cameras work fairly well, to truly capture the magnificent colors and textures of the ice, you should bring a high quality camera. Buy tickets online in advance. Had we stopped in Colorado all those years ago, we probably would have been turned away. The attraction often sells out, especially on weekends, so book your time slot in advance. 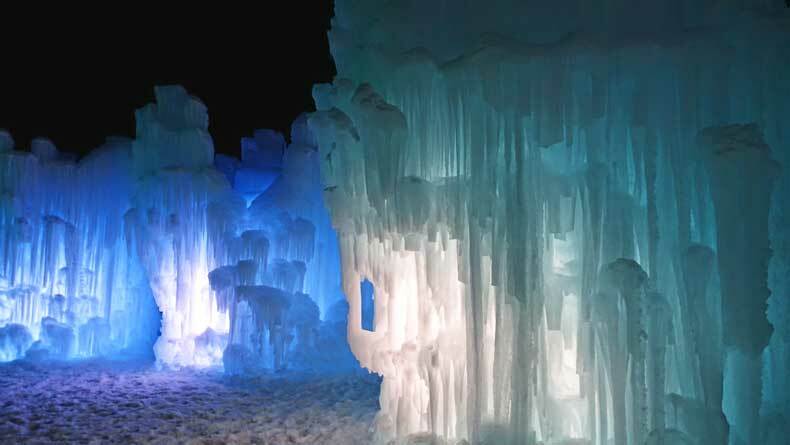 Have you been to Ice Castles? We’d love to hear from you. Leave us a comment and let us know which location you visited and your thoughts. If you’re looking for another ice adventure, you should check out this place! Easy to travel from OKC and not too far away! Also, they have one of the best winter sledding park around!! Definitely worth the drive from Quebec City!! Thanks for sharing your blog, I always enjoy reading your stories! Ive heard of this place! I would love to visit someday. My husband and I were actually talking about visiting Quebec in 2018. Unfortunately, it wouldn’t be until summer or fall, so this place won’t be open. But hopefully someday. Thanks for sharing! this looks pretty cool! Ive never heard of this. Im surprised they dont have this here in NYC! My boys would love this! I’d like to see if we can visit one of these this winter. It’s so interesting seeing the pics and experiences in the other locations! I went to the one in NH! Was there a giant ice slide in CO too? Haha I actually wrote a post about it too but had to update since they had some weird update about deciding no longer to charge for parking (when it had been free all the past years). Your fire show pic looks so cool! They do have a giant ice slide at the Colorado and Utah locations. And several little ones for small kids, too. It is very pretty. More than anything it’s just something unique and different to do in winter. Wow, wow, wow! Talk about winter wonderland!! Definitely check it if you are ever around one of the cities where they create them in the states. It’s a lot of fun and beautiful! Wow, amazing post and images as well. I can’t wait to visit the Ice castles after reading your article. I would definitely plan a trip this winter so that I can enjoy the view of wonderful ice castles. Keep sharing such interesting articles. Awesome place to visit. 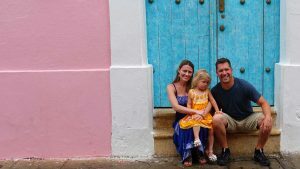 My husband is planning a family trip for this winter and I would love to suggest him this beautiful place. 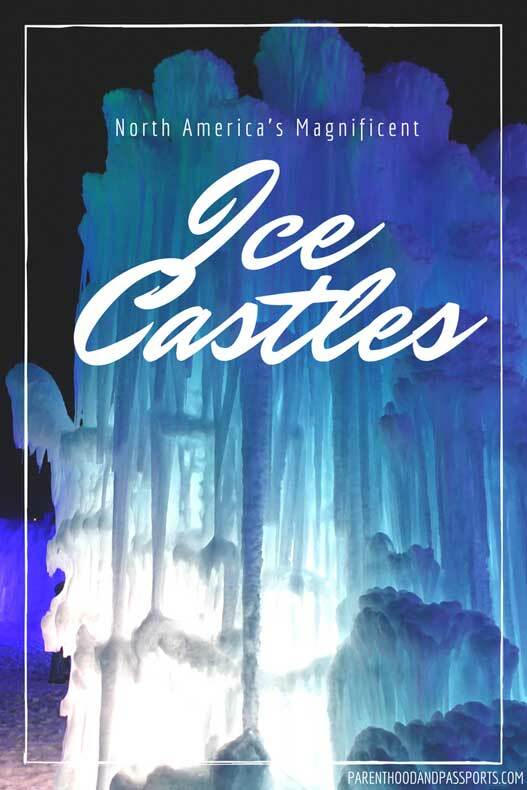 The ice castles are so interesting and eye catchy that I can’t wait to go there. Keep posting such interesting destinations. It really is beautiful! And so unique. I hope you make it to one someday!